TCS’s customized cleaning contracts include light duty cleaning (such as vacuuming, restroom and kitchen care, spot cleaning, etc. ), floor care (such as scrubbing, waxing, and buffing), and special project work. Their clients are predominantly medium-sized offices, government offices, organizations (schools, churches, community centres), and strata buildings. Founded in 2004 as a non-profit, TCS has expanded from $20,000 in revenue and five employees in its first year of operation to $1.16 million in revenues and 70 employees in 2016. This growth has relied on a dedicated commitment to employee wellbeing and a strong focus on customer satisfaction. TCS enjoys an extremely low employee turnover rate of 20% compared to an industry average estimated at between 75% to 400%—making them unique in the janitorial sector. Their success can be highlighted by the fact that approximately 89% of their contracts in 2015 were returning clients. Despite their success, TCS’s journey over the past 12 years did not come without the challenges of balancing growth with organizational capacity and competing in a hyper competitive market (among other things) while staying true to their mandate. 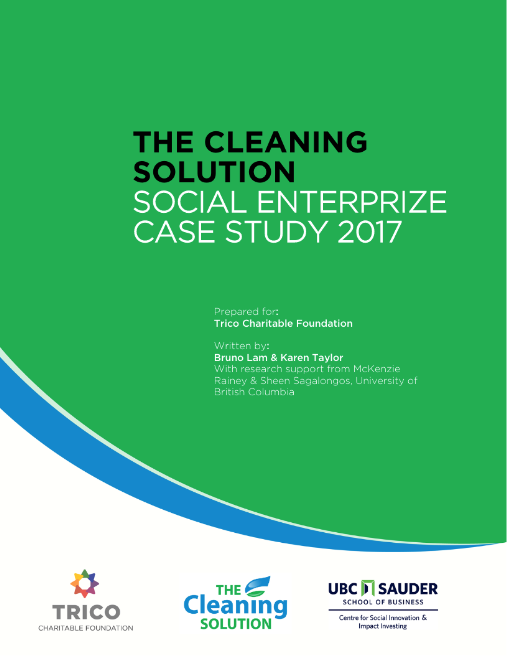 This case study highlights a number of the significant challenges and the actions that were taken to overcome them for the purposes of providing key insights and lessons for future social entrepreneurs.